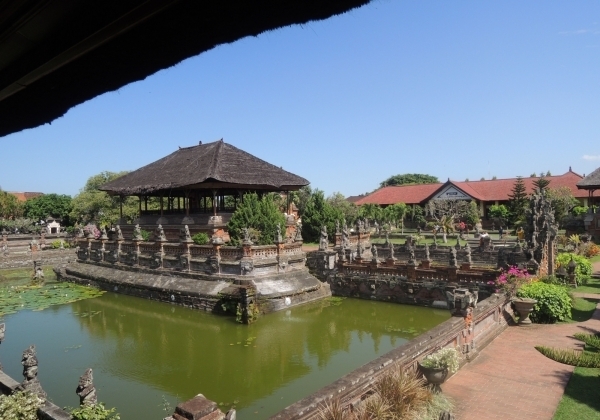 Ubud the cultural center of Balinese people and Sanur with white sandy beaches. We have included cultural highlights of Bali like the Barong and Kris dance. Please send an inquiry if you like to do other activities or book other hotels. The Bali tours starts in Ubud the cultural center of Balinese people. Sanur the beautiful white sandy beach of Bali. Bali. After arrival in the airport of Bali (please give us your flight number) we will fetch you and transfer to Ubud. Ubud is the artistic center of Bali and home to artists with their ‘expressionistic’ style paintings. The paintings you can see in one of the many galleries. 2 overnight stays in Bali Spirit (Emerald room) in Ubud. In the morning start an excursion to see the Barong and Keris Dance. The dance story presents the endless metaphysical battle between good and bad. The Barong represents the good force of nature. After the Barong performance tour will continue to Agung Rai Museum and then to Pura Dalem Agung Padangtegal. You continue your journey to visit Wanara Wana – sacred monkey forest and the ancient King Palace of Puri Saren in Ubud. In Sribatu you can explore the nice spice gardens. Ubud – Sanur. Today we transfer you to Sanur. 3 overnight stays in Parigata Resort (Run of the house) in Sanur. Sanur – After breakfast is our first tour destination the Barong Dance at Batubulan, hereafter visit Celuk Village – the center of silversmiths, Tegalalang – to see beautiful rice terraces. Then continue to Kintamani where we can admire the Mount Batur, an active volcano rising 5,000 feet above sea level and the lake Batur besides. On the way back via Denpasar we will visit Goa Gajah – beautiful elephant cave temple with stops at Mas Village – the center of wood carving and Tohpati village with nice Batik galleries. In the afternoon back to the hotel. Sanur – own program to relax at the beautiful beach of Sanur. No car is available. Sanur – Bali airport. Leisure time till transfer to the airport to catch your flight to the next destination. End of our service. We can customize the above tour according to your wishes. – private transport for all tour & transfers. – private English speaking guide for all sightseeing tours. (July – Sept’18 & 15 Dec’18 – 15 Jan’19) = US$ 55,- p.p.